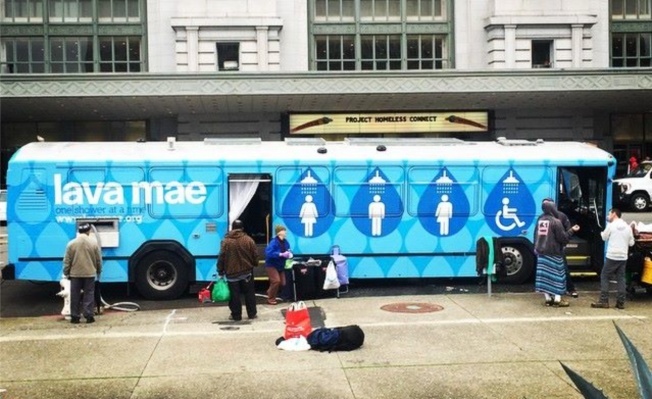 A Lava Mae bus provides showers and toilets for homeless people in San Francisco's Tenderloin. Lava Mae, a bus that provides showers and other basic hygiene services for the homeless, will soon expand its route. Founder Doniece Sandoval launched the San Francisco nonprofit last summer. She currently operates buses Wednesdays through Saturdays in the Tenderloin and Mission Districts of San Francisco. The vehicles are old diesel buses from MUNI that were donated. In a video released for Lava Mae's launch, Sandoval said that outside of her efforts, there are only seven places in San Francisco where a homeless person can go to take a free shower and there are more than 3,500 homeless people on the city's streets. "I just thought, if you could put gourmet food on wheels and take it anywhere, why not showers and toilets?" Sandoval said in the video. Sandoval told Hoodline that if she gets approval, she will be able to bring Lava Mae to the Upper Haight in the next few months. She had near universal support at a meeting of the Haight Ashbury Neighborhood Council last week.